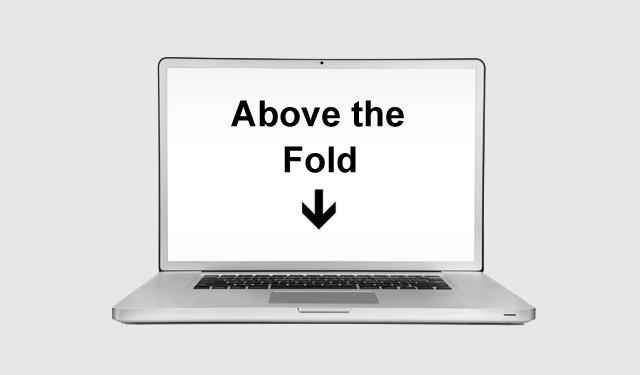 Web Design 101: What Does “Above The Fold” Mean? What Does “Above The Fold” Mean In Web Design? Above the fold is sometimes used in web development to refer the portions of a webpage that are visible without scrolling. The part of the page that is not above the fold. The part of a webpage that can't be seen without scrolling down. Understanding what “above the fold” means is a basic, but critical component in web design. You want to be sure to design your website around this concept with your best and most appealing attributes shown in this area to entice readers to continue to scroll down to the content below the fold. If your place boring, dull, or misleading content above the fold, chances are your readers will leave the page without scrolling to the rest of your content. The catchy part about “above the fold” is that the fold can vary based on your visitor's resolution. This can get a bit confusing, but according to statistics the above the fold portion is on average larger than it has ever been in earlier years with an average resolution over 1024 x 768. For more tips on designing a website above the fold, scroll down and view the excellent infographic! Have a question about this concept? Ask it in the comments section below! So what can I use to test my companies website? I’m particularly interested in the feedback about the “above the fold” section of our site. (Good, bad, how to change so it’s working). Is there something I can use to track the states of our page? My boss has someone else that designed and maintains the site, so I can’t use anything I have to actually link in the page. Ideas? Hey guys, nice information on web design and above the fold scheme. I have a question that i have found a website named revglue who is offering to monetize your website by redesigning it and provide all the affiliate related data. I was wondering if any of you have experience with this kind of service provides who want share in your revenue for their services. Please provide me any good advice about if i should hire this company to handle my website. You can check what they are offering here affiliate web design revglue(dot)com/bespoke . Any help will will be greatly appreciated. Thanks in advance.